The Sange-Perdi saga was set to the side this week as Black Lightning’s focus returned to more established struggles. Khalil’s change of heart set him square in Tobias’ crosshairs. Choosing to skip town alongside old flame, Jennifer, spiked Black Lightning’s interest as well. A stereotypical pair of teenage runaways now has both sides in the fight for Freeland set to collide in their most personal battle to date. Khalil and Jennifer’s Cadillac cruise gets off to a bumpy start when Khalil makes a pit stop at Club 100. The two need cash, which he decides to rectify by robbing the Tobias-controlled 100 gang. 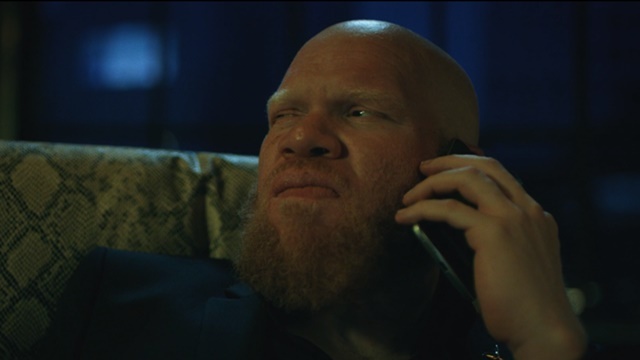 That plan devolves into a gun fight after Khalil learns of the bounty Tobias has placed on his head. Jennifer comes to her beau’s rescue, using her powers publicly for the first time to blind the shooters. The pair escape, but are forced to find a new car and hope Khalil’s aunt will allow them to stay the night before leaving Freeland for good. Things grow more tense when Khalil freaks out at Jennifer’s desire to call her parents. Khalil refuses to let her before convincing his aunt to take them in for the night. Having a roof over their head calms the two immensely. Enough to elicit an apology from Khalil for his earlier harsh tone. Tobias’s abusive treatment of his former protege left him desperate to protect his and Jennifer’s safety, but he knows lashing out at her isn’t right. Jennifer accepts his apology and Khalil gives her a burner phone so she can call her parents safely. Khalil’s transformation continues when Jennifer cuts off his dreadlocks, revealing a curious lump on his head. He apologizes for blaming Jennifer for his initial paralysis. The irony in getting their wish to run away together after all isn’t lost on either of them. However, Khalil’s head isn’t going to shave itself.. The mystery surrounding Jennifer’s running mate doesn’t last long for the Pierce family. Anissa brings up the text message sent to Jennifer by Khalil as the family and Gambi begin their search. Jefferson is visibly upset at the withheld information, but there is no time to discuss it with Jennifer missing. After sifting through a few red herrings, Gambi spots footage of Jennifer’s blinding orb at Club 100. Black Lightning and Thunder shakedown the gang members for information, but Jennifer calls them as they leave. She lets them know she is safe and hangs up before Gambi is able to trace the call. Jefferson consoles Lynn after she breaks down in Jennifer’s room. The situation grows worse when he confronts Anissa about keeping Khalil’s text message a secret. Anissa counters by pointing out that his treatment of Jennifer pushed her away. The Pierce house became a prison for her, so it would make sense that she’d try to escape at some point. However, Jefferson has little time to reflect on this. Khalil’s mother visits Lynn following a scary encounter with Tobias. She informs them of her sister’s home and that Khalil likely would head there if he were still in Freeland. Lynn relays the information to Black Lightning and Thunder, finally giving them a destination. Tobias might have a “no mama” rule, but that shouldn’t cloud his ruthless nature. He realizes his stubbornness in trying to force Khalil to become a killer. The crime lord vows to never make the same mistake again to a painting of a woman referred to as Tori. The first step in this new approach: hiring an assassin named Cutter to bring Khalil back alive. The two clearly have a history together, but Tobias’ disdain for hiring black people isn’t getting in the way of business this time. He give Cutter a tracking device to find the former Painkiller and sends her on her way. Cutter arrives on Khalil’s aunt’s doorstep in no time flat. She immediately goes on the offensive against Khalil, sending a flurry of throwing knives his way. He responds with poison darts that miss Cutter, but hit his Aunt. The fight spills into the Kitchen with Cutter pinning both Khalil and Jennifer. Luckily, Black Lightning arrives in time to save Khalil’s life and allow them to escape. The fight continues until Cutter escapes after being thrown from the house. Jennifer destroys Gambi’s drone and escapes into the woods with an injured Khalil. She identifies the lump on Khalil’s head as a tracking device and he asks her to short it with her powers. Jennifer is hesitant, but Khalil’s trust gives her the confidence to control her powers and disable the bug. Tobias remains in high spirits despite Cutter’s failure. Her complaints about running into Black Lightning and Thunder start his mental cogs in motion. Black Lightning’s continued involvement in situations involving Jennifer starts to bring everything into clear view as Tobias plans his next move. 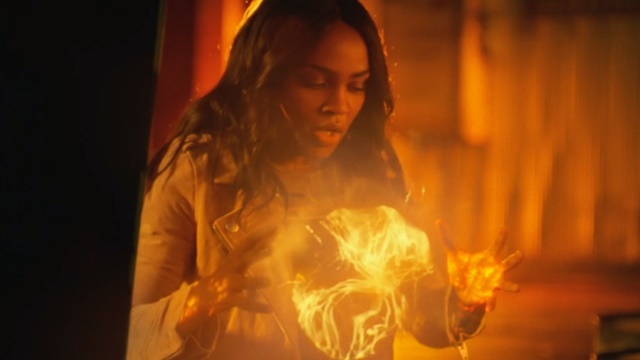 What do you think about Black Lightning season 2 episode 8? Let us know in the comment section below!